When you have skunk problem in Oregon City we are able to solve your problem and remove unwanted skunks from your property. When you have skunk's living under your house the first things that you notice is usually the strong odor. We have found that the best way to solve most skunk problems is to trap and remove the pest critter from either under your house, deck, or shed. Then we always recommend sealing up those areas to prevent future skunk problems along with other nuisance wildlife from moving in. 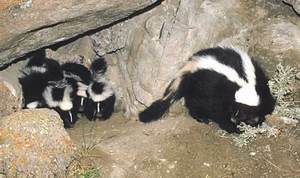 If you notice you have a skunk problem and it is in an area where kids and pets are active, it is important to be careful and limit the time around that area until you have a professional remove the skunks. During the spring and summer in Oregon City skunks will have babies. During this time the mother can be more protective and the babies can not control there spray as well. If you need help or would like more information feel free to contact us. Oregon City Skunk Control and Removal Call 503-201-2432!